Shame is a very cruel thing because it cripples us for life. It may range from embarrassment to complete unworthiness. It damages our personality and confuses our identity. The roots often go down to different experiences in our childhood. Some of the common ones are failure, weakness, accusation or emotional or sexual abuse. Only when we come to the foot of the Cross, will we be set free from shame. The scars of shame can only be healed by the grace of God. Isaiah 50:6 “I gave my back to those who struck me, and my cheeks to those who plucked out the beard, I did not hide my face from shame and spitting”. 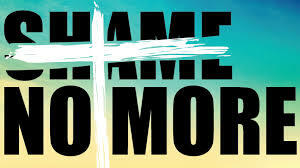 On the Cross, Jesus bore our shame. There is no form of death more shameful than crucifixion. It was the lowest form of punishment reserved for the most debased of criminals. The Cross was an instrument of shame and torture. The victim was stripped completely naked. Jesus hung naked on the Cross before the eyes of people for three hours or more. People walked past and made fun of him. Hebrew 12:2 “Jesus, the author, and finisher of our faith, who for the joy set before Him, endured the Cross, despising the shame”. The shame that Jesus endured on the cross has opened the way for all who trust in Him to be released from their own shame. Not only that, He then also shares with us the glory which belongs to Him by eternal right! Dear Lord, we thank You that You took not only our sins away on the cross but also the shame. We pray that we would have a boldness and love for others and share Your great love with them. In the Name of Jesus, Amen.